MUCH QUESTION. WOW BUCKET. VERY FOOD YOU HAVE IT? 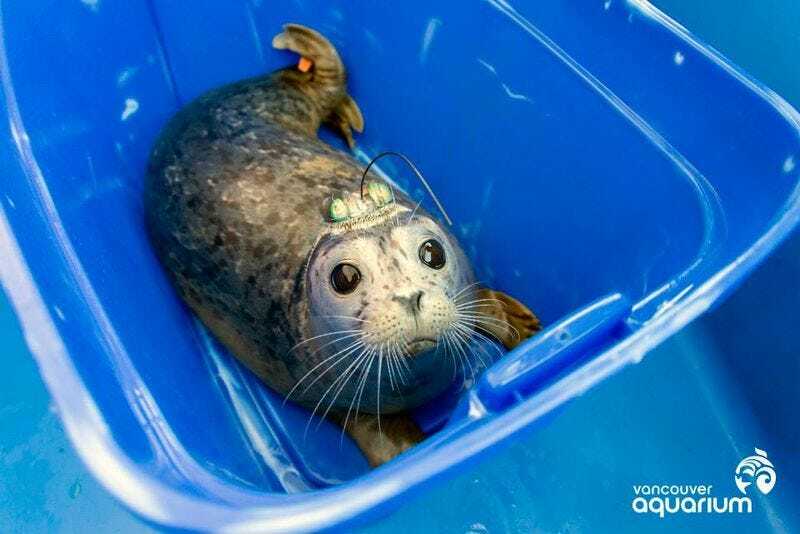 These seven seal pups are being released back into the wild by the Vancouver Aquarium Marine Mammal Rescue Centre, which makes its business saving sick, injured or orphaned marine mammals. Look at the little faces! In the water, the transmitters don't weigh anything, and the seals don't seem to be bothered by them at all! They aren't invasive; no part of the animal has been punctured or any pain caused. They will fall off by the time the animals molt next spring, if not before. When the animals move, the antennas point backwards, and so they don't affect the seals' ability to swim.The transmitters are the result of decades of collaboration between veterinarians, biologists, engineers, and programmers. MOAR BABIES? I GOT THIS.